With the seasons changing and the weather finally starting to warm up, it’s time to start thinking about our summer wardrobe. And luckily for us, John Lewis has answered all our fashion needs and wants with a superb on-trend skirt that is perfect to see us through the warmer months. 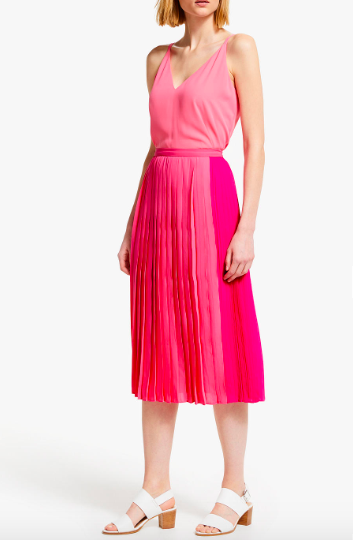 The John Lewis & Partners Colour Block Pleat Skirt is a gorgeous midi length that meshes contemporary colour block detailing with traditional pleat styling, and offers a versatile alternative to skinny jeans. And it’s so pretty, that the high-street store have confirmed to W&H that the skirt is one of their best-selling fashion items at the moment! John Lewis describe the skirt as “a subtle A-line shape for a defined silhouette, the contrast colour panels also contrast in pleat width – narrow on one colour palette and wide the other – adding character as well as a slight density to the fabric that gives it a bit of a kick as you move”. You don’t have to worry about the material showing off more than you intended either, as it is fully lined and has a concealed side zip fastening to maintain a polished finish. For summer style, you could add a silk camisole or cotton T-shirt, and as the weather dips the John Lewis skirt will look just as good with a beautiful cashmere jumper or leather jacket. Pink is also a huge colour for spring and summer this year, with different shades featuring all over the catwalks from London to New York. Buy the John Lewis skirt here. But if pink isn’t your colour, then you’ll be happy to know that you can also buy the skirt in a black and mustard mash-up, or light blue and navy. It is currently in stock in all colours and all sizes from 8-20, and priced at £65, which we think is a bargain, considering how much wear you’ll be able to get out of it.